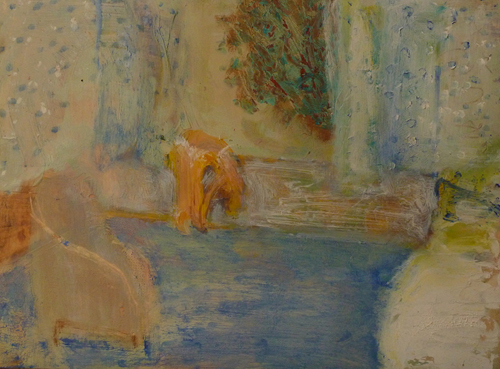 I have painted a series of rooms remembered from my childhood – I lived in four different houses, each with a particular character which still invades my dreams. 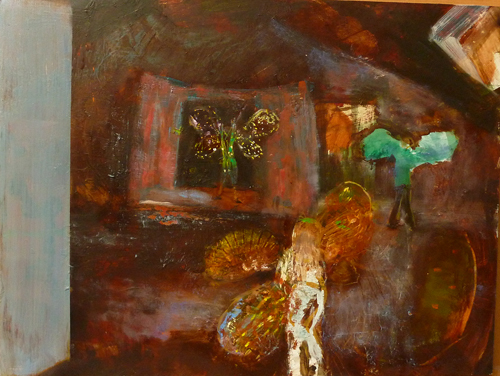 The paintings started out from a spark of memory, but soon developed into parallel places – rooms of the imagination. They came into being as much from the formal properties of painitng as they did from any ideas I was entertaining. When I was about five or six, I used to play a game with my brothers and sisters which involved hiding behind furniture in the room which was used on more formal occasions, therefore usually empty. The object was to see others, but not be seen. We called it The Sitting Room Game. 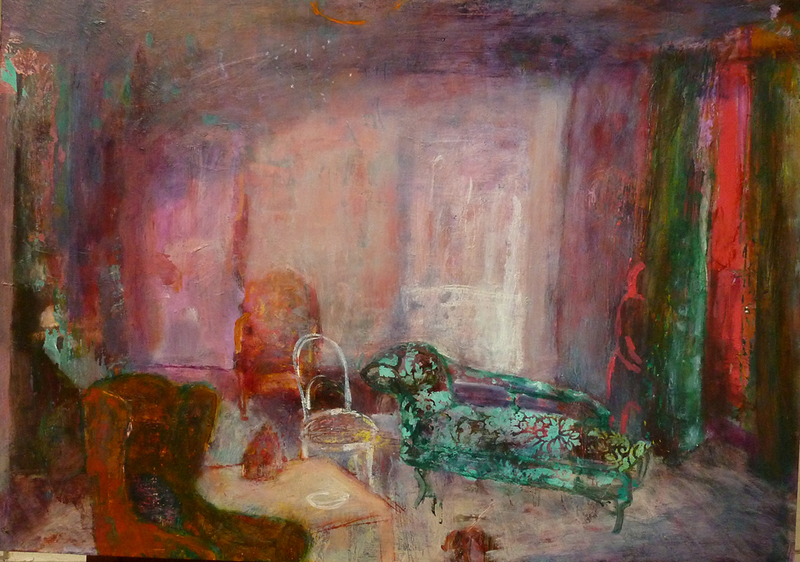 As the painting developed I added a chaise longue, which was a memory from about ten years later. The furniture is somewhat dwarfed by the high walls of the room and there is a hint of a figure behind the curtain. About the same time, I was a member of The Butterfly Club with my sister and a friend of hers who lived locally. We held meetings in a disused attic box-room. All three of us had butterfly names – I was Red Admiral – and we invented a code. My brothers started a club at the same time, whose sole purpose was to sabotage ours. In the painting, I have retained the memory of the skylight, although I have made the room large with a stage. We are all wearing butterfly wings and the whole atmosphere is more like what was in our fantasies rather than the reality of having to barricade ourselves in against attack. Reverie isn’t really a remembered room at all. It refers to the longing to learn the piano as a child. We eventually got a piano when I was twelve, but I wasn’t allowed to take the free lessons at school as they didn’t want beginners and we couldn’t afford private lessons. My parents got fed up with all of us children hammering out chopsticks, so they sold it after a year. I finally took my first piano lesson at the age of 45 and discovered Debussy. Reverie is too difficult for me to play, but I would love to be able to. 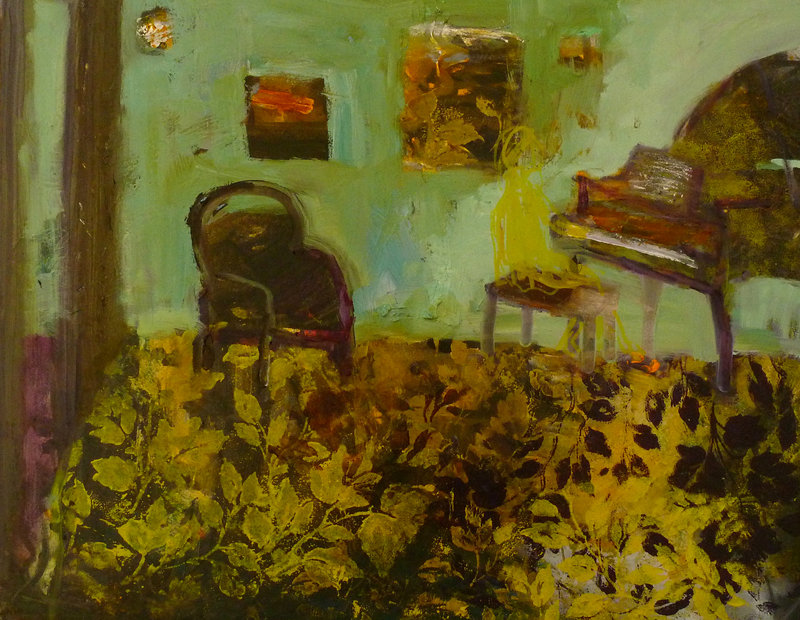 In this painting, the pianist is rather ethereal and the pattern on the carpet takes over. Dimity was the name of the wallpaper I had in my teenage bedroom. It could come in either blue or white. I chose blue. The curtains matched the wallpaper which was a very seventies fashion. It was nice to be surrounded by all this pale blossoming. I spent a lot of time in my room daydreaming.